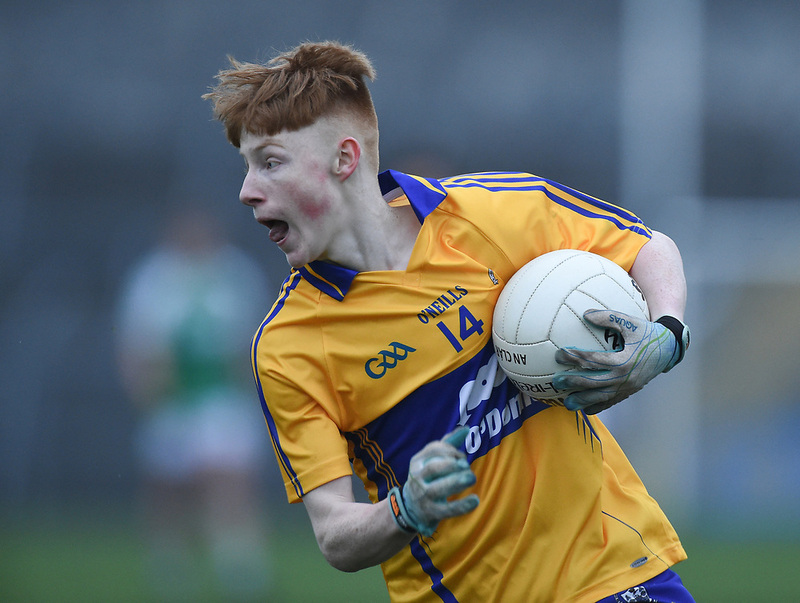 A strong second quarter from Clare in which they hit 1-5 unanswered helped them overcome a stubborn Limerick challenge in the opening round of the Electric Ireland Munster Minor Football Championship. Jamie Stack’s goal mid-way through the opening half kickstarted a period of dominance for Dermot Coughlan’s side, after a slow start to the game saw them trail by 0-5 to 0-2 early on. Barely a minute had elapsed when Dara Nagle found the angled run of Shane Meehan and the Clare captain was fouled on the 20 metre line close to the sideline. He dusted himself down to arrow over a free from the left hand side to open the scoring. The home side in Newcastlewest hit back with a fine score from midfielder Matthew Southgate to level proceedings with five minutes gone. The Clare defence were under plenty pressure early on and Limerick hit the front when Eliah Riordan landed an excellent free off the ground from 45 meters out. He repeated the trick just moments later from a much tighter angle, and Limerick led 0-4 to 0-1 after the opening ten minutes. Southgate was proving a tough act to handle for Clare and he extended their lead after a strong run through the heart of the defence. Clare hit back when good work from Brendy Rouine sent Cillian McGroary racing clear, and he laid off to Meehan who made no mistake with a fine point off his left leg. Indiscilpline in the Clare defence was punished once more when a foul on Riordan led to Shane Hanrahan converted a free from close range to keep Limerick three clear. Clare started to grow into the game and they got their reward at the turn of the first quarter. Brendy Rouine went into the clouds to gather a kick-out and he found Meehan in support. He in turn put the ball into the path of Jamie Stack, and the St Breckan’s man hammered a brilliant finish to the bottom corner of the net to restore parity. Nagle added an excellent point from the right wing soon after, and a free from Stack just moments later saw Clare 1-4 to 0-5 ahead approaching the last ten minutes of the half. Stack was impressing in the inside line and he added another score of real quality before Meehan did like-wise and Clare were well in control. Meehan added one more from play before landing another free to see his side 1-7 to 0-5 ahead with the half-time whistle looming. Meehan was wearing the number 14 jersey, but was operating around the middle third of the field and causing problems there too. 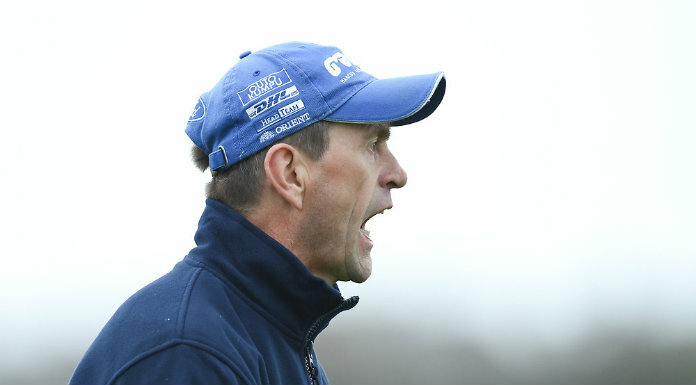 Limerick’s running game was still providing plenty challenges for Clare, and they finished the first half scoring with another free to leave just four points between the sides at the break. Meehan was returned to the edge of the square for the second half, and got his sixth of the contest with a free soon after the restart. Limerick answered straight away with a strong run from Riordan seeing him slot over his third, and when O’Donoghue finished off a patient move soon after the gap was back to three. Meehan continued to pose a constant threat and he converted a free he won himself to keep Limerick at arm’s length. He then turned provider for Tadgh Lillis to raid from corner back for an excellent score, but again direct running from the home side yielded reward as O’Donoghue pointed in reply to keep four between them. With the game in the melting pot, it was Clare who made the crucial move as Brendy Rouine found Ennistymon clubmate Diarmuid Fahy, and he slotted home to put daylight between the sides as the contest moved toward the final quarter. Clare dominated from here and outscored Limerick 1-5 to 0-1 in the closing stages with Stack, McGroary, Lillis and Eoin Talty (2) all getting on the scoreboard. The icing on the cake arrived as the game hit injury time when Rouine was the provider once more as he played in Talty who cooly slotted home. Clare now face Tipperary in Ennis next Wednesday night with the winners of that game guaranteed to make the final of the opening phase. Clare: Oisin O’Loughlin (St Breckans); Tadgh Lillis (Doonbeg), Micheal Garry (Cooraclare), Ciaran McMahon (Ennistymon); Cillian McGroary (Corofin), Alan Killeen (St Joseph’s Doora Barefield), Matthew Reidy (Shannon Gaels); Eoin Rouine (Ennistymon), Brendy Rouine (Ennistymon); Pat Doherty (St Breckans), Diarmuid Fahy (Ennistymon), Dara Nagle (St Joseph’s Doora Barefield); Conor Hassett (Kildysart), Shane Meehan (Banner, c), Jamie Stack (St Breckans). Subs: Eoin Talty (St Joseph’s Doora Barefield) for Doherty, Fionn Kelliher (St Joseph’s Doora Barefield) for Reidy, Stephen Casey (Clondegad) for Eoin Rouine, Thomas Meenahan (Banner) for Hassett, Eoin Walshe (Banner) for Stack. Scorers: Shane Meehan (0-6, 4f), Jamie Stack (1-3, 2f), Eoin Talty (1-2), Diarmuid Fahy (1-0),Tadgh Lillis (0-2), Dara Nagle and Cillian McGroary (0-1 each). Limerick: Shane O’Connell (Fr Casey’s); Daniel Geraghty (St Kieran’s), Patrick Dolphin (Crecora), Frank Corcoran (Mungret St Paul’s); Eoin McGrath (Galbally), Eliah Riordan (Fr Casey’s), Tom Marsden (Ahane); Michael Southgate (Adare), Darragh O’Keeffe (Fedamore); Mark Donnellan (Ahane), Shane O’Donoghue (Ballylanders), Peter O’Dwyer (Galbally); Conor Galvin (Mungret St Paul’s); Shane Hanrahan (Galbally), Ruadhan O’Connor (Newcastlewest). Subs: Jack Corkery (Knockaderry) for O’Connor, Jack Quinlivan (Fr Casey’s) for O’Dwyer, Rian McBrearty (Monaleen) for Marsden, Rory O’Connor (St Senan’s) for Hanrahan. Scorers: Shane O’Donoghue (0-4, 1f), Eliah Riordan (0-3, 2f), Michael Southgate (0-2), Shane Hanrahan (0-1, 1f).